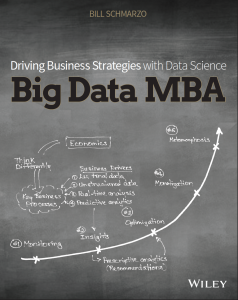 I never planned on writing a second book (“Big Data MBA: Driving Business Strategies with Data Science”). Heck, I thought writing one book was enough to check this item off of my bucket list. But so much has changed since I wrote my first book that I felt compelled to continue to explore this once-in-a-lifetime opportunity for organizations to leverage data and analytics to transform their business models. And I’m not just talking the “make me more money” part of businesses. Big data can drive significant “improve the quality of life” value in areas such as education, poverty, parole rehabilitation, healthcare, safety, and crime reduction. Organizations do not need a big data strategy as much as they need a business strategy that incorporates big data. The days when business leaders could turn analytics over to IT are over; tomorrow’s business leaders must embrace analytics as a business discipline in the same vein as accounting, finance, management science, and marketing. Finally, the business potential of big data is only limited by the creative thinking of the business users. I’ve also had the opportunity to teach “The Big Data MBA” at the University of San Francisco (USF) School of Management since I wrote the first book. What I experienced while working with these outstanding and creative students and Professor Mouwafac Sidaoui compelled me to undertake the challenge of writing this second book targeting those students and tomorrow’s business leaders. One of the topics that I hope jumps out in the book is the power of data science. There have been many books written about data science with the goal of helping people to become data scientists. But I felt that something was missing—that instead of trying to create a world of data scientists, we needed to help tomorrow’s business leaders think like data scientists. The days when business stakeholders could relinquish control of data and analytics to IT are over. The business stakeholders must be front and center in championing and monetizing the organization’s data collection and analysis efforts. Business leaders need to understand where and how to leverage big data, exploiting the collision of new sources of customer, product, and operational data coupled with data science to optimize key business processes, uncover new monetization opportunities, and create new sources of competitive differentiation. And while it’s not realistic to convert your business users into data scientists, it’s critical that we teach the business users to think like data scientists so they can collaborate with IT and the data scientists on use case identification, requirements definition, business valuation, and ultimately analytics operationalization. This book provides a business-hardened framework with supporting methodology and hands-on exercises that will help business users to not only identify where and how to leverage big data for business advantage, but will also provide guidelines for operationalizing the analytics, setting up the right organizational structure, and driving the analytic insights throughout the organization’s user experience to both customers and front-line employees. Part II: The Role of Data Science. Part II includes Chapters 5 through 7 and covers the principals behind data science. These chapters introduce some data science basics and explore the complementary nature of business intelligence and data science, and how these two disciplines are both complementary and different in the problems that they address. Part III: Data Science for the Business. Part III includes Chapters 8 through 12 and seeks to teach the business users and business leaders to “think like a data scientist.” This part introduces a methodology and several exercises to reinforce the data science thinking and approach. It has a lot of hands-on work. Part IV: Building Cross-Organizational Support. Part IV includes Chapters 13 through 15 and discusses organizational challenges. This part covers envisioning, which may very well be the most important topic in the book as the business potential of big data is only limited by the creative thinking of the business users. Chapter 1: The Big Data Business Mandate. This chapter contains new material that frames the big data discussion on how big data is more about business transformation and the economics of big data than it is about technology. Chapter 2: The Big Data Business Model Maturity Index. This chapter updates the Big Data Business Model Maturity Index (BDBM) with new learnings, which is the foundation for the entire book. Take the time to understand each of the five stages of the BDBM and how the BDBM provides a roadmap for measuring how effective your organization is at integrating data and analytics into your business models. Chapter 3: The Big Data Strategy Document. This updated chapter introduces an improved CXO level document and process for helping organizations identify where and how to start their big data journeys from a business perspective. Chapter 4: The Importance of the User Experience. This is one of my favorite topics. This chapter challenges traditional Business Intelligence reporting and dashboard concepts by introducing a more simple but direct approach for delivering actionable insights to your key business stakeholders—front-line employees, channel partners, and end customers. Chapter 5: Differences Between Business Intelligence and Data Science. This entirely new chapter explores the different worlds of business intelligence and data science, and highlights both the differences and the complementary nature of each. Chapter 6: Data Science 101. Another entirely new chapter (my favorite) reviews 14 different analytic techniques that my data science teams commonly use, and in what business situations you should contemplate using them. It is accompanied by a marvelous fictitious case study using Fairy-tale Land Theme Parks (thanks Jen!). Chapter 7: The Data Lake. This entirely chapter introduces the concept of a data lake, explaining how the data lake frees up expensive data warehouse resources while unleashing the creative, fail-fast nature of the data science teams. Chapter 8: Thinking Like A Data Scientist. The heart of this book, this entirely new chapter covers the 8-step “thinking like a data scientist” process. This chapter is pretty deep, so plan on having a pen and paper (and probably an eraser as well) with you as you read this chapter. Chapter 9: “By” Analysis. This entirely new chapter does a deep dive into one of the important concepts in “thinking like a data scientist”—the “By” analysis technique. Chapter 10: Scores. This entirely new chapter introduces how scores can drive collaboration between the business users and data scientist to create actionable scores that guide the organization’s key business decisions. Chapter 11: Monetization Exercise. This entirely new chapter provides a technique for organizations that have a substantial amount of customer, product, and operational data, but do not know how to monetize that data. This chapter can be very eye-opening! Chapter 12: Metamorphosis Exercise. This entirely new chapter is a fun, out-of-the-box exercise that explores the potential data and analytic impacts for an organization as it contemplates the Business Metamorphosis phase of the Big Data Business Model Maturity Index. Chapter 13: Power of Envisioning. This is an updated chapter that addresses some of the organizational and cultural challenges you may face. In particular, Chapter 13 introduces some envisioning techniques to help unleash your organization’s creative thinking. Chapter 14: Organizational Ramifications. This entirely new chapter goes into more detail about the organizational ramifications of big data, especially the role of the Chief Data (Monetization) Officer. Chapter 15: Stories. The book wraps up with some case studies, but not your traditional case studies. Instead, Chapter 15 presents a technique for creating “stories” that are relevant to your organization. Anyone can find case studies, but not just anyone can create a story. This book is targeted toward business users and business management. I wrote this book so that I could use it in teaching my Big Data MBA class, so I’ve included all of the hands-on exercises and templates that my class would need to successfully earn their Big Data MBA graduation certificate. I think folks would benefit by also reading my first book “Big Data: Understanding How Data Powers Big Business,” which is targeted toward the IT audience. There is some overlap between the two books (10 to 15 percent), but the first book sets the stage and introduces concepts that are explored in more detail in this book. As students from my class at USF have told me, this material allows them to take a problem or challenge and use a well though-out process to drive cross-organizational collaboration to come up with ideas they can turn into actions using data and analytics. What employer wouldn’t want a future leader who knows how to do that?